Using the New Technology Telescope (NTT) by the European Southern Observatory, scientists have, for the first time, studied the internal structure of an asteroid. 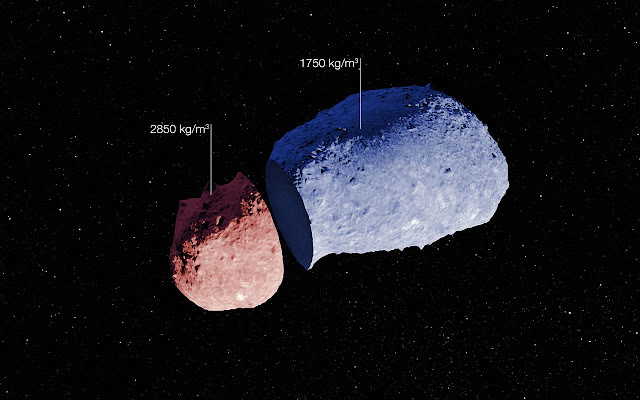 The NTT studied the peanut shaped asteroid Itokawa. It helped scientists measure the asteroid's brightness variation as it rotates. Knowing the irregular peanut shape of Itokawa, the data gathered allowed them to accurately calculate its spin period. This also gave the scientists an insight to find out what the asteroid is like below the surface and also at its core. This discovery, already a big step in understanding asteroids, will also help understand how planets are formed and what happens during outer space collisions. This small asteroid is an intriguing subject as it has a strange peanut shape, as revealed by the Japanese spacecraft Hayabusa in 2005. To probe its internal structure, Lowry’s team used images gathered from 2001 to 2013, by ESO’s New Technology Telescope (NTT) at the La Silla Observatory in Chile among others, to measure its brightness variation as it rotates. This timing data was then used to deduce the asteroid’s spin period very accurately and determine how it is changing over time. When combined with knowledge of the asteroid’s shape this allowed them to explore its interior — revealing the complexity within its core for the first time.